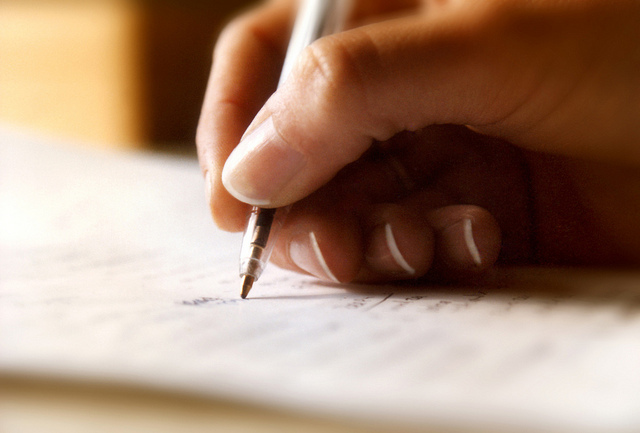 Can you think of the last time you received a handwritten letter? Not a notecard or a birthday card or a post card, but an actual letter? If you’re like me, you can’t. In a world of technology overload, something handwritten is rare; in fact, it sometimes seems an oddity. Why would someone write a letter and send it via snail mail, when they could simply zip an email to us in mere seconds? My answer: the power of sacrificed time and personal openness. Catherine Fields in her NYTimes.com essay “The Faded Art of Letter Writing” believes a handwritten letter to be a “deliberate act of exposure, a form of vulnerability, because handwriting opens a window on the soul in a way that cyber communication can never do.” And it’s in the vulnerability and sacrifice that today’s Word Gift finds it’s being. I am much better at writing than talking. Oh, I love a good gab with a friend, but if something really important needs to be said, then I sit down with my notebook and favorite pen. Writing keeps me honest. I can express my true feelings on paper in a way that never occurs when I open my mouth. To some, being able to say exactly what you feel might not always be the right thing to say. But I find that when I write a letter, what I need to say is said more effectively, with more kindness, and “speaks the truth in love” better than any conversation I’ve ever had with someone. Letter writing is not only about the words on paper, but about presentation as well. A crisp, clean white sheet of paper, folded neatly and tucked inside a starched envelope brings a sense of value, exactly what you want the recipient of a Word Gift to feel. Before they ever read a word, they will feel significant. However, once they begin to read the words penned by a friend, spouse, or parent the significance will grow into value. The subject of the letter could be anything. Maybe simply remembering a special time that they two of you shared would make for a great reminder of their value. We could write about simple days, lived out in ordinary ways, but gave extraordinary comfort. Possibly, encouragement needs to be poured into a discouraged life. A letter can do most anything. It’s only us who need to decide what power it brings to the life of the recipient. My old scrapbooks brims with handwritten love letters received in high school and college; scribbled notes on tattered notebook paper from best friends lined the corners of memory boxes filled away in my closets. Maybe one or two printed emails could be found in those scrapbooks and boxes, but they aren’t valued quite as much as those written by the hand of a loved one. The curve of their S’s and the dot of their I’s will be a comfort to me when they are gone. Their handwriting connects me to them in a way that the binary letters printed in black and white never could. So today, sit down and pull out a sheet of pristine paper and begin to pen your love for someone. Let the ink speak words that might never cross your lips. And in years to come, when they rifle through that box of moments, they will pull out the letter from you and feel it’s power all over again. This entry was posted in Word Gifts, Writing on October 30, 2012 by aliciachall28.